The Good Wife’s Guide above has been around for a while. Some claim it came from The Housekeeping Monthly in the 1950’s – others insist it was from an earlier generation. Still others say it’s somebody’s idea of a joke. Regardless, it is worthy of a response. Here is my official response to The Good Wife’s Guide that my husband handed me, right before he ducked. I’ve listed each tip and my response is in blue and italics below it. 1. Have dinner ready. Plan ahead, even the night before, to have a delicious meal ready on time for his return. Okay, before we go any further, just when would that be? Most men are hungry when they get home, and the prospect of a good meal (especially his favorite dish) is part of the warm welcome needed. First, I thought I was his favorite dish. Secondly, lobster is his favorite meal, but in today’s tough economy, I’ve been working very hard (he’s not the only one who works, you know) to make our food dollars stretch a little further, but the two lobster tails won’t mate. Serenading lobster is a time-consuming task. It might not leave me with any time to make dinner. 2. Prepare yourself. Take 15 minutes to rest so you’ll be refreshed when he arrives. Touch up your makeup, put a ribbon in your hair and be fresh looking. He has just been with a lot of work-weary people. 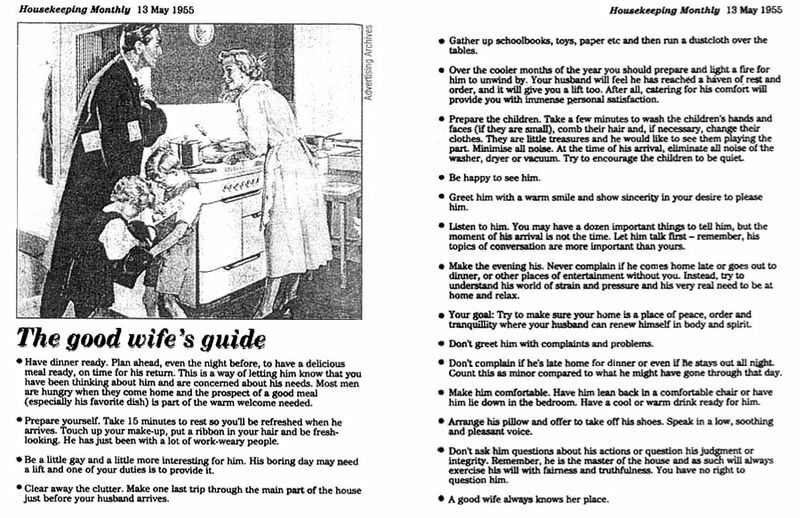 If you read further into this Good Wife’s Guide, you’ll know why it isn’t possible to accomplish this husband-pleasing task. But, I’ll give you a few reasons. While I was resting for 15 minutes, the kids painted the bathroom walls with my lipstick and strangled the cat with my pretty hair ribbon. Besides that, saying husbands are work weary and then suggesting that they have the energy to stay out all night (#9) is contradictory. A more realistic look at this task is in order. 3. Be a little gay and a little more interesting to him. His boring day may need a lift, and it’s your duty to provide it. Well, might I suggest that if he wanted me to be a little gay, that should have been discussed long before I became his good wife, although I’ll admit it would probably make things interesting. I may have to sacrifice the lobster farm, though, to have time to become a “little” gay and lead such an interesting life. 4. Clear away the clutter. Make one last trip through the main part of the house. Gather up schoolbooks, toys, paper, etc., and then run a dust cloth over the tables just before your husband arrives. Okay, we’re back to #1 again. Just when will that be? And if I did all of that, I wouldn’t be rested, fresh, and look all dolled up anymore per instruction #2. When you decide what you really want, get back to me. 5. Over the cooler months of the year, you should prepare and light a fire for him to unwind by. Your husband will feel like he’s reached a haven of rest and order and it will give you a lift, too. After all, catering for his comfort will provide you with immense personal satisfaction. So does raising kids, but that doesn’t mean I had to enjoy childbirth. Besides that, shouldn’t I be getting most of my immense personal satisfaction from him and the gay, interesting life I lead on the side? Oh, and hand me the short end of the stick I keep getting. I need more kindling. 6. Prepare the children. Take a few minutes to wash the children’s faces and hands, comb their hair, and if necessary, change their clothes. All right. Stop right here. The children have been changing their clothes ten times a friggin day since they were two. Isn’t eleven times unreasonable? Minimize all noise. At the time of his arrival, eliminate all noises of the washer, dryer or vacuum. Try to encourage the children to be quiet. For starters, there aren’t enough hours in the day to wash and dry the 10 loads of clothes that the kids go through and you’ve just added one more load. I’ll also have to assume that the dead cat’s fur can just stay on the floor, but doesn’t that violate #4? But I think I can keep the children quiet. I’ll go get the duct tape. 7. Be happy to see him. Greet him with a warm smile and show sincerity in your desire to please him. I “sincerely” tried this once. Wearing nothing but a smile, I wrapped myself in Saran Wrap and waited to greet him at the door. But by the time he got home, my smile and most of my body had melted away. And somehow, the Saran Wrap got stuck to the duct tape on the two-year-old’s mouth, and her lips are now stuck to my thigh. I’m beginning to believe that you’re setting me up to fail here. 8. Listen to him. You may have a dozen important things to tell him, but the moment of his arrival is not the time. Let him talk first – remember, his topics of conversation are more important than yours. Okay, but I’m sure he’s going to notice the totaled car in the driveway, and I hope the boa constrictor that got out of its cage doesn’t slither up his leg before he’s done saying the all-important things he has to say. I’ll wait to tell him, too, that the Department of Homeland Security has disclosed that duct tape will be the weapon of choice in the future, and that we are now under suspicion because of the large quantities I’ve been buying to keep the kids quiet. Therefore, I must curtail my duct tape purchases for the unforseeale future. He may suspect something’s wrong without me saying anything, though, because the kids are pretty noisy without it. 9. Make the evening his. Never complain if he comes home late, stays out all night, goes out to dinner or other places of entertainment without you. Instead, try to understand his world of strain and pressure and his very real need to be at home and relax. I must really point out that the contradictions simply have to stop. If he has such a very real need to be at home, then he could and should come home. That aside, how can I have his lobster ready, be fresh, and keep the house and the kids clean if he comes home late? Why should I even have to make his favorite dish if he’s going out to dinner? We could’ve spared one of those poor little lobsters. No comment, however, is necessary on the “other places of entertainment.” I’ve become a little gay to make his life more interesting. That’s all the entertainment his strained and pressured day can handle. 10. Try to make your home a place of peace, order, and tranquility where your husband can renew himself in body and spirit. Finally, here’s one that is doable. But it will probably require tying up the children, in addition to purchasing another roll of duct tape. I’ll have to take lasso throwing lessons to catch them, though, so I may have to abandon my gay, interesting life and my 15 minutes of so-called rest. He better enjoy the peace and tranquility while his kids are bound and gagged, because I have a pretty strong hunch that it borders on child abuse. If that happens, I’ll probably be in jail when he’s looking for his favorite dish tomorrow night. Be careful what you wish for. Don’t say I didn’t warn you. 11. Arrange his pillow and offer to take off his shoes. Speak in a low, soothing and pleasant voice. Yes, I have heard that many people on the brink of insanity often have a strange sense of calm about them before they lose it. 12. Don’t ask him questions about his actions or question his judgment or integrity. Remember, he is the master of the house and as such, will always exercise his will with fairness and truthfulness. You have no right to question him. 13. A good wife always knows her place. Yes, of course she does. She also knows her husband’s place, and she takes a break from her gay, interesting life to visit him at the cemetary every Sunday. Costumes for Kids: Mom, I Wanna Be a Lego!